Looking to start a career in one of the fastest growing occupations? Hawkeye’s six-week accelerated Class A Commercial Driver’s License (CDL) training program is designed for adults who would like to train for a high-demand career in a short-term time frame. The program focuses on developing safe driving skills including backing, turning, and driving on rural and suburban roads. You will receive hands-on training using full-size semitrailers and virtual driving simulators. Upon completion, you will take your vehicle inspection, DOT skills, and driving tests at Hawkeye to obtain your Class A CDL. You receive individual training daily on your schedule, choose your times: morning 8:00 a.m. to 12:00 p.m., afternoon 1:00 p.m. to 5:00 p.m. or evening 5:00 p.m. to 9:00 p.m. Graduates can find employment in a variety of areas including, but not limited to, a truck driver, spotter, shag driver, and many more. 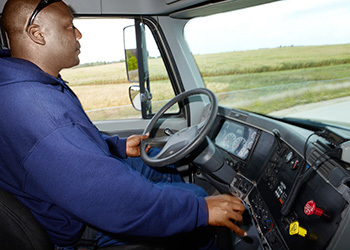 Per FMCSA rules students are required to complete and pass Department of Transportation (DOT) long form physical and pre-employment drug screening before start of the class. Arrowhead Medical Center is Hawkeye's approved vendor for DOT pre-employment drug screening and may be used for DOT physical as well. Tuition pays for books and training and does not include a DOT drug test ($50-$100), DOT physical ($80-$150), and CDL permit ($12). For detailed instructions, click here. Please read: Must pass DOT physical and pre-employment drug screening prior to starting class. Please request from Arrowhead Medical Center to notify Hawkeye Community College of your test results.